Looking to capture the NBA in "a uniquely artistic way" (no offense, Marv Albert! 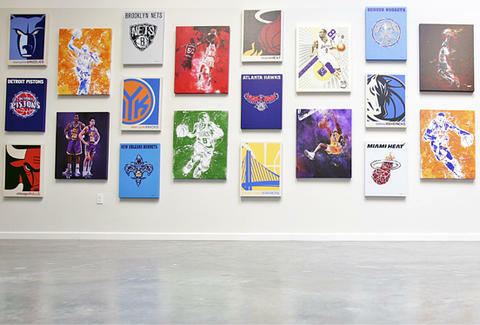 ), the sports-art marketplace known as Rareink partnered with the league on a special collection of 100 original, "museum-quality" prints featuring iconic players, moments, and team logos. The ltd ed, hand-numbered pieces're available as fine paper prints or on stretched canvas, with styles ranging from minimalism to "ultra-realism", so maybe James Harden will actually disappear from your painting when the Finals start. As for subject matter, it runs from old school legends (a mid-air Magic), to modern stars (a dribbling Rondo...), to famed groups (Run TMC, Stockton & Malone...), plus tweaked logos for each of the 30 current teams.